Pothos | Warner Companies, Inc. 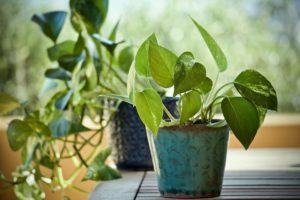 This week’s houseplant feature is the lovely – and very easy-going – Pothos. These versatile houseplants look great in a pot or hanging in a container (they look particularly fetching in macrame hangers, which are making a big comeback.) They grow well in bright light or direct light, meaning they pretty much will flourish anywhere in your home. Even better, they are not susceptible to insect infestation and they rarely get any type of fungus or disease.